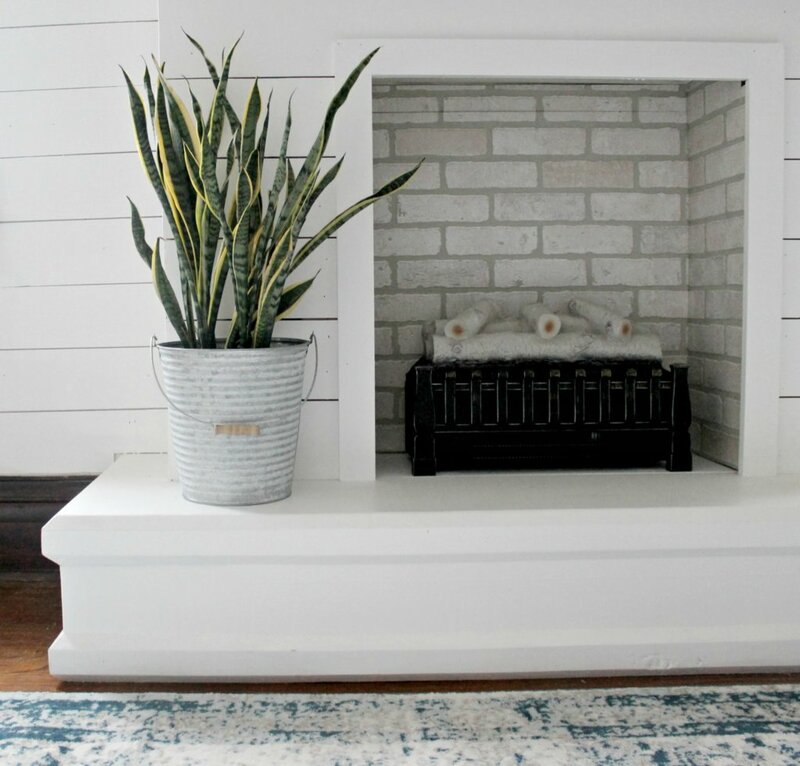 I’m so excited to be sharing our DIY Shiplap Fireplace with you guys today! This project was a beast that took us many months to complete but it is absolutely and completely finished and I couldn’t be more excited! From the very first time we saw our house, we knew it was a dream come true for old-house lovers like ourselves. The only thing it was missing? 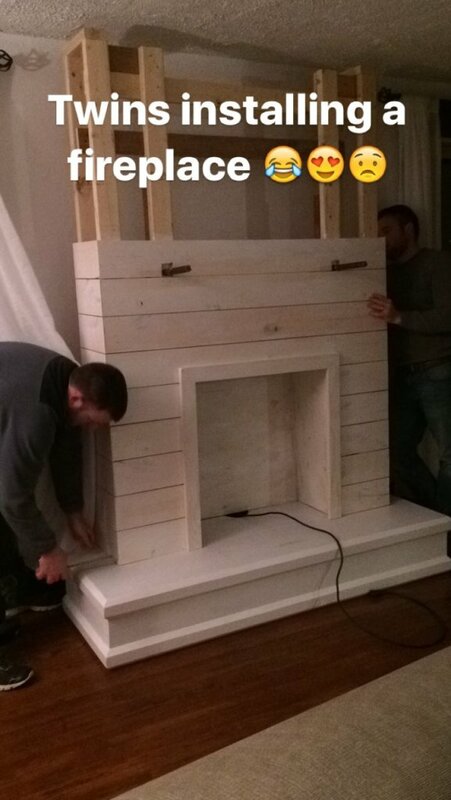 Yeah, you guessed it–a fireplace! The big space between these two windows was literally screaming at me to install a fireplace. Pardon the mess because, ya know, real life. That Hoosier cabinet is right where the fireplace sits now. By approaching the project as if we were constructing a real fireplace and then adding electric logs, I got my wish. Our fireplace surround is both completely “faux”, and yet is fully functional as a heating unit. The best part?! It only cost around $400 to make, and that includes the space-heater! Are you ready to take a peak behind the scenes?! I’ll warn you that my husband is not a “follow directions” kind of guy. He built the fireplace and he literally made up the plans in his head as he went along. 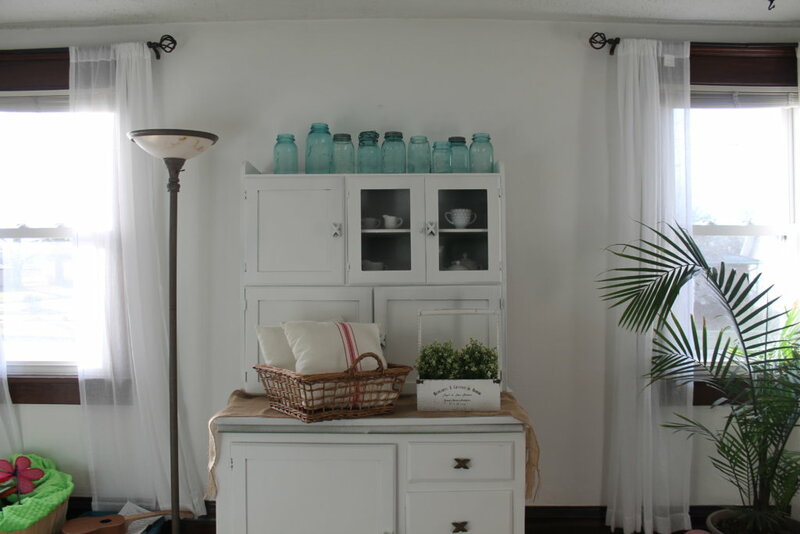 As such, I don’t have a hard and fast set of directions for what we did, but I can show you what it looks like inside so you have a better understanding of what’s going on, as well as how you can customize it for your space! 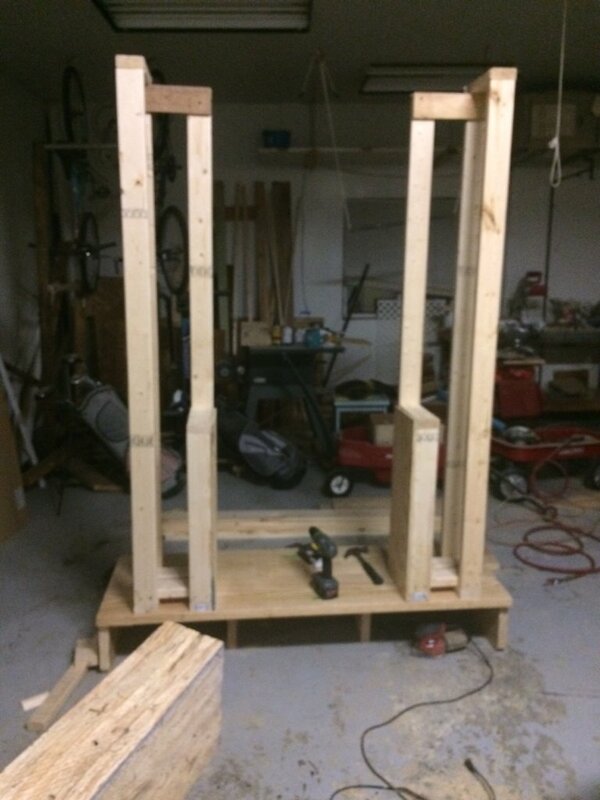 The first thing he did was build the frame out of 2×4 boards. This shot is the back view of the fireplace frame. You can see that he built out a box for our space heater. The top of the hearth was made out of two 2x12s, because that is what best fit our space. You can also see how he supported them underneath with 2x4s running the width of the boards. After this, he moved it into our house, but it was very heavy and you could certainly build the whole thing in your home, right where you want it installed. The next step was to attach the frame to the wall. Once they drilled the two by fours into the wall, it was time to hang the mantle. We actually chopped down our own tree and made our very own rough-hewn mantle, which I will be sharing very soon! You can see the two metal bars coming out of the middle of the fireplace–that is what supports the mantle and how we attached it to the fireplace surround. Lets talk about our heating element for a minute. For the longest time, we considered going with one of the flat LED fireplaces that essentially look like flat screen TVs. I was totally fine with this, but my husband thought it would ruin the vibe we were going for, and in the end, I think he was right. We found this Duraflame birch log heater at our local Menards. It actually heats up to 1000 square feet, which really came in handy when our furnace broke a few months ago!! When you turn it on, the logs glow, and it casts a flickering light on the wall behind it. I can personally attest that it is every bit as mesmerizing as a real fire. While our particular model is no longer available (we had to buy the display model just to get it! ), this is the most comparable one available. 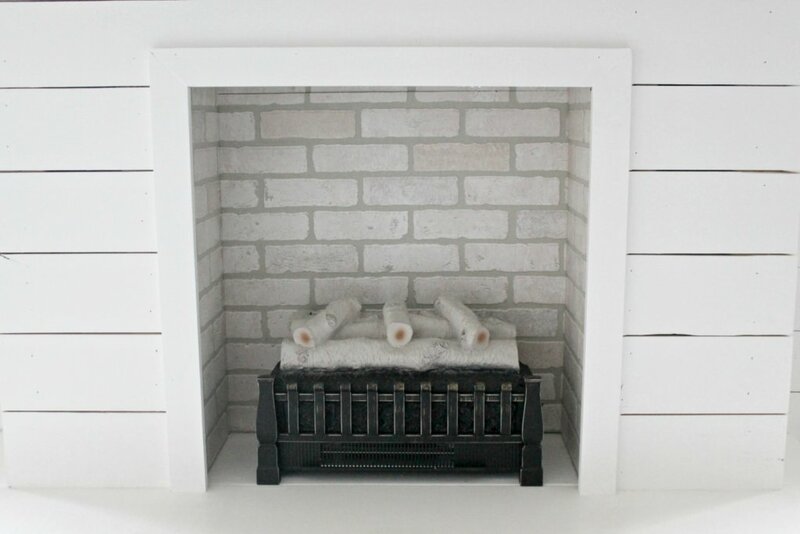 The brick surround in the fireplace is actually whitewashed brick paneling cut to fit. To really build out the hearth and keep it from just being a plain ol’ box, my husband added some angle-cut trim around the top and the bottom. I think it was the perfect finishing touch! 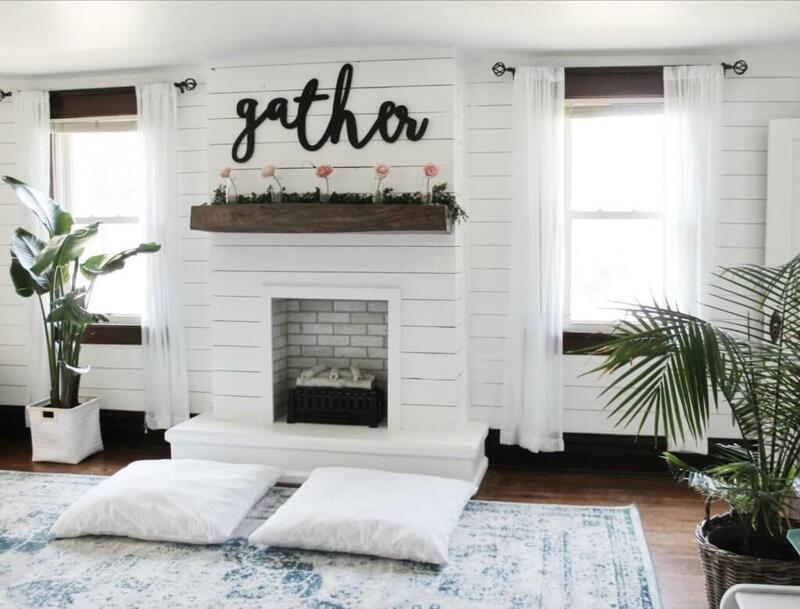 And by the way, the “gather” sign hanging on the mantle was handmade Heidi of Feather and Birch. Doesn’t she make the most amazing signs?! So what do you guys think?! My husband is by no means a master woodworker or builder and I think he did an amazing job! Simple? Yes. Quick? Not so much. But totally, totally worth it in the end! This post contains affiliate links. Thank you for helping support the brands that make The Definery Co possible!! Thank you so much! It is from wayfair!!! I, too would like to know what paint you used and if it was flat or satin. Hi, Kelle! We used off the shelf white in eggshell!! Hi! It is the largest size by Feather and Birch! Never mind I see!!! lol didn”t see the cost. This looks amazing!! 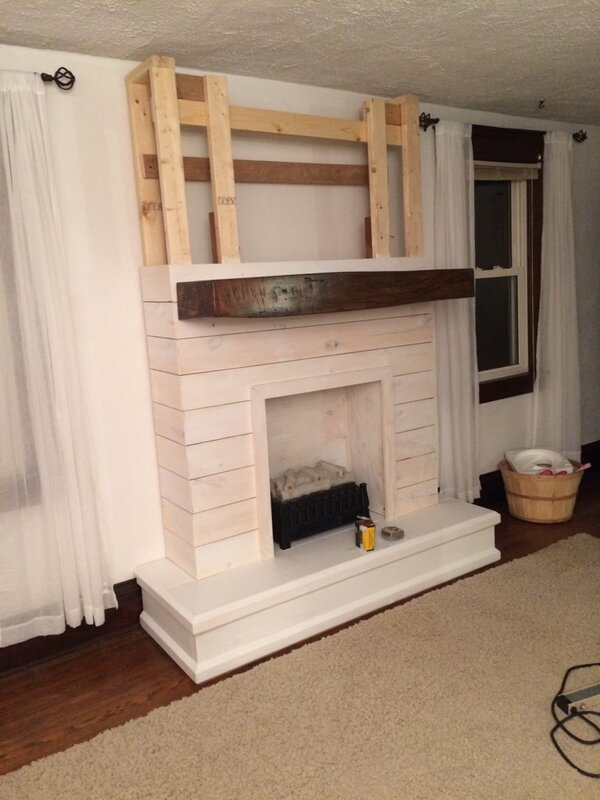 What color stain is the wood mantle? Thank you so much! We used mine wax special walnut!! How did you get that affect on your brick panelling? We actually bought it that way in a sheet from Menards! Looks great! What material did you use at the base (the part of you can sit on)? We used 2x12s and 2x10s, then trimmed it out in 1x4s! Hi! Would you happen to have link to your rug? Or the name of it? I love it! Thank you! It is from Wayfair! I believe it is the Ford blue area rug! Did you buy the trim around the top and base of the hearth, or did you cut it from a board yourself? If so, how did you do it? 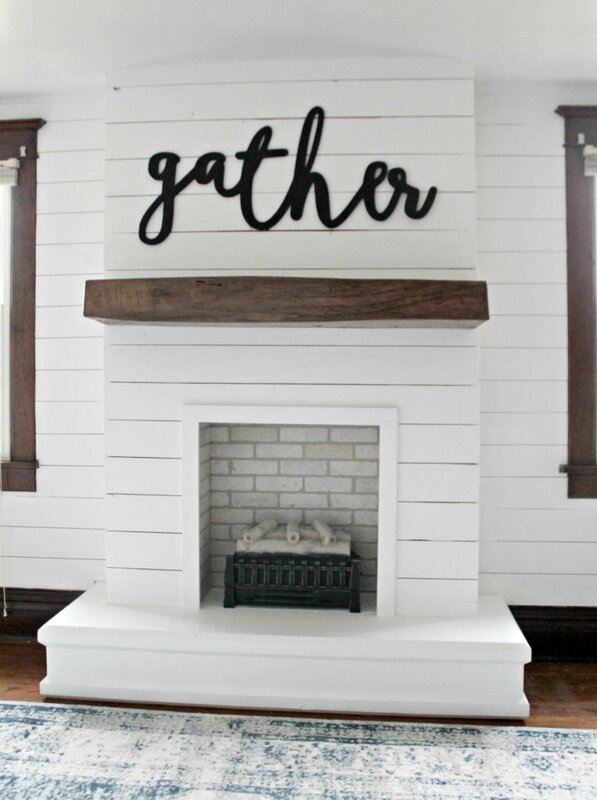 What are the dimensions of the fireplace and hearth?